Laura Collins was born on January 1, 1731, the daughter of Captain Daniel and Lois Cornwall Collins of Guilford, Connecticut. She was descended from the first settlers, and brought up in the manner of Connecticut girls of well-to-do families of that day. She was a woman of almost masculine strength of mind, energetic and thrifty; and while Governor Wolcott was away from home, attended to the management of their farm, educated their younger children, and made it possible for her husband to devote his energies to his country. Oliver Wolcott was born on November 20, 1726, at South Windsor, Connecticut. He was the youngest son of Roger Wolcott, a Royal Governor of Connecticut from 1751 to 1754. Oliver graduated from Yale College in 1747 at the top of his class, and immediately began his military career. He was commissioned to raise a militia company to fight in the French and Indian War, and he served the King as captain in this unit on the northern frontier. Back home, he studied medicine under his brother, Dr. Alexander Wolcott, but when he had just completed his studies, he was appointed sheriff of the newly-organized county of Litchfield, Connecticut, in 1751. This was the first of a long string of county and state offices: county sheriff (1751-71); member of the lower house (1764, 1767-68, and 1770) and upper house (1771-86) of the colonial and State legislatures; and probate (1772-81) and county (1774-78) judge. By 1774, he had risen to the rank of colonel in the militia. Laura Collins married Oliver Wolcott on January 21, 1755, of Guilford, Connecticut. Oliver brought his new bride to his home in the old town of Litchfield. Five children were born to Laura Wolcott and her husband, three sons and two daughters; one son died in infancy; the other children were as follows: Oliver, born 1760; Laura, born 1761; Mary Ann, born 1765; and Frederick, born 1767. The Wolcotts enjoyed a loving marriage for almost forty years, despite the fact that Oliver spent many of those years away from home, helping to give birth to a new nation. During many of these years, almost the entire burden of directing his domestic affairs rested on his wife’s shoulders. 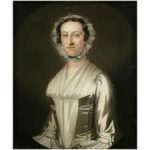 During his long absences, Laura Wolcott cared for and educated their four children, and by her prudence and frugality provided the necessities of life for her family. Laura Wolcott’s patriotism was as strong as that of her husband. And while Oliver Wolcott gave freely of his money for the support of the Continental Army, Laura furnished blankets, stockings, and supplies from their farm for the army, almost continuously. She made her home a place of comfort and tranquility, which was always open to anyone serving the patriotic cause, even during the war. Extracts from the letters Oliver wrote to Laura during his absences throw an interesting light upon the characters of both Laura Wolcott and her husband. Her letters to him were not preserved. I feel much concerned for the Burden which necessarily devolves upon you. I hope you will make it as light as possible…. You may easily believe that the situation of public Affairs is such that the critical Moment is near which will perhaps decide the Fate of the Country; and that the business of Congress is very interesting. Yet if any excuse can reasonably be allowed for my returning, I shall think myself justified in doing so. The circumstances of my affairs demand it. In 1774, Oliver Wolcott was appointed an assistant in the State Council, which was the beginning of his political career. To the office of assistant, he continued to be annually re-elected until 1786. In the interval, he was for some time chief judge of the Court of Common Pleas for the county, and judge of the Court of Probate for the district of Litchfield. Also in 1774, the Continental Congress appointed him a Commissioner of Indian Affairs in order to secure a treaty at the council at Albany. Toward the close of 1775, Wolcott was elected a delegate to the Second Continental Congress, and took his seat in January 1776. He took a prominent part in the debates respecting the independence of the Colonies. Absent at the time of the voting for independence the next month and at the formal signing of the Declaration of Independence in August, Wolcott added his signature to that document when he returned to the Congress in October. Wolcott was present when members of the Continental Congress fled to Baltimore when British troops occupied Philadelphia in late 1776. After serving in the military again, Wolcott returned to the Congress in October 1777, then assembled in York, Pennsylvania, and served off and on until 1784. On the state level, Wolcott continued his long period of service in the upper house of the legislature, which ended in 1786; enjoyed a lengthy stint as Lieutenant Governor (1787-96); attended the convention that ratified the U.S. Constitution (1788); and, like his father before him and his son after him, held the office of Governor from 1796 until his death. In 1771, as revolutionary tensions grew, Oliver Wolcott rejoined the Militia. He was made a Major, and later a General in the Connecticut Militia. He devoted portions of every year to militia duty. 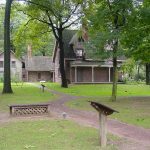 In June 1776, illness caused him to return to Connecticut. As soon as he was well, he was appointed by Connecticut Governor Jonathan Trumbull and the Council of Safety to the command of a detachment of Connecticut militia (consisting of fourteen regiments) destined for the defense of New York City. On July 9, 1776, Wolcott was in New York City when he witnessed a demonstration in the streets. General George Washington had received a copy of the Declaration of Independence, which was read to his troops. At the conclusion of the reading, a group of soldiers and patriots toppled a 4000-pound equestrian statue of King George III. The statue, which had been erected on Bowling Green in 1770, was made of lead coated with a fine layer of gold leaf, either shattered or was smashed into many pieces by the crowd. When Wolcott saw the fallen statue, inspiration struck. He had the pieces collected and shipped to the port of Norwalk, Connecticut, where they were then loaded onto ox carts and rolled the sixty-odd miles to the general’s home in Litchfield. There, in the orchard behind their house, Oliver and Laura Wolcott and their children, and some local patriotic ladies, melted the lead and shaped it into bullets for the war effort. Wolcott’s son Frederick would later attest that his father took an ax and chopped up some of the lead pieces himself. It was reported that the Wolcotts and their merry band made 42,088 bullets from the statue. Laura, age fifteen, made 8,378; Mary Ann, age eleven, 10,790; and Frederick, age nine, a respectable 936. The proud papa took the bullets to Saratoga, where he and his militia helped defeat Burgoyne. During the latter part of the summer of 1776, Wolcott was actively engaged in the recruiting service. After sending General Israel Putnam several thousand volunteers, Wolcott took command of a brigade of militia, and joined General Horatio Gates at Saratoga, New York. There he took part in the defeat and surrender of British General John Burgoyne in October 1777. In the summer of 1779, Wolcott took command of a division of militia and defended the Connecticut seacoast against the raids of William Tryon, Royal Governor of New York. When General Tryon began his expedition of plunder and devastation of Connecticut towns, Fairfield and Norwalk were laid in ashes, and other towns plundered, but the heroic work of General Wolcott’s command thwarted many plans of the British. After the war ended in 1783, Wolcott settled into a semi-peaceful life, though remained active in politics. When fellow Declaration signer Samuel Huntington died in 1796, Wolcott became the governor of Connecticut, a position his father had held forty-five years earlier. Shortly before Wolcott died in 1797, he had the pleasure of voting for John Adams as the second president of the United States. In 1784 and 1785, Wolcott was one of the Commissioners who negotiated terms of peace with the Six Nations, who inhabited Western New York. Laura Collins Wolcott did not live to see her husband in the governor’s chair; she died at Litchfield, CT, on April 19, 1794, at the age of 63. 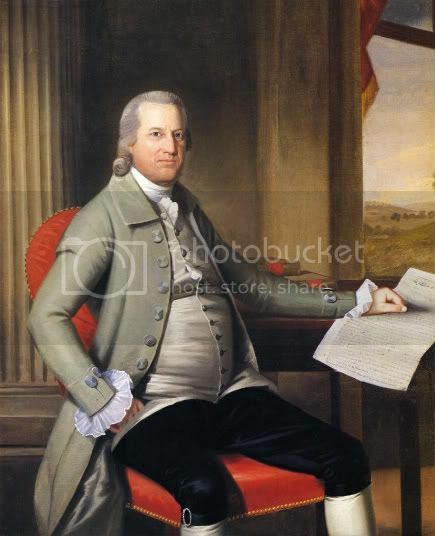 Governor Oliver Wolcott died on December 1, 1797 at Litchfield, CT, at age 71. He was buried at East Cemetery in Litchfield alongside his wife. Their son, Oliver Wolcott Jr. (1760 – 1833), succeeded Alexander Hamilton as Secretary of the Treasury under Presidents George Washington and John Adams, and the first Governor of Connecticut under the new Constitution.